Topics: Exercise Therapy And Personal Training, & Ergonomics. It is hosted by A Small Orange Llc (Missouri, Saint Louis,) using nginx web server. Its 2 nameservers are ns2.asmallorange.com, & ns1.asmallorange.com. 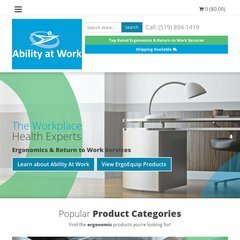 Abilityatwork.ca's server IP number is 65.99.237.163. PING (65.99.237.163) 56(84) bytes of data. A time of 25.7 ms, is recorded in a ping test.